It’s my final day here at the Marketing United event in Nashville, but it’s also episode 500 of the show. I am grateful for being able to serve my audience and for having the opportunity to speak with inspirational people all over the world and how they are using technology to transform their business or make a difference in the world or remove a problem. While here in Nashville I bumped into Kathleen Guzman from Liberty Tax. We got talking about how they are attempting to put fun into taxes. As the US prepares to file their taxes ahead of the deadline in a few weeks, we discuss how crypto profits will indeed be taxed. 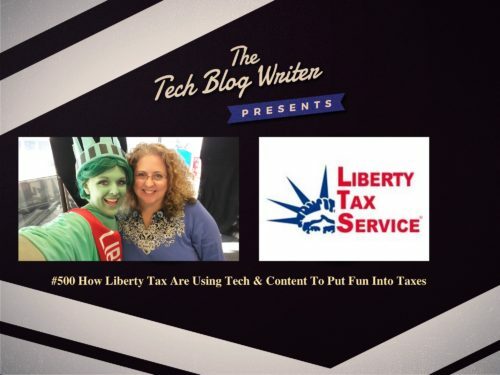 However, it is the importance of technology, content, and storytelling that is proving to be a major part of their success at Liberty Tax. Kathleen also tells me why they have partnered with EMMA Marketing at the Marketing United event. Kathleen opens my eyes to how even tax services marketing heavily relies on storytelling, but all year round and not just in tax season. As a marketing specialist, her templates go beyond blog posts, landing pages newsletters and emails. On September 1, 1997, tax legend John Hewitt acquired a Canadian tax franchisor, U&R Tax Depot. In 1998, the company opened five offices in the U.S. and became Liberty Tax Service®. Today, they have more than 4,000 Liberty Tax Service® offices in the United States and Canada, and they prepare more than two million individual tax returns annually.